Beautiful reliquaries with high level of abstraction. Beautiful reliquaries with a bell shaped face. Beautiful Fang reliquaries showing concept of "balance of opposites". Protective fetish, or fecundity doll. Masks characterized by round tops, flat bottoms, and expressive coffee bean eyes. Beaded face mask with long front. Initiation mask with cherubic forehead proportions. Very popular. Abstract representation of facial features. Worn over the top of head. Very expressive, may show scarification. Masks representing the struggle between life/death, sickness/health. 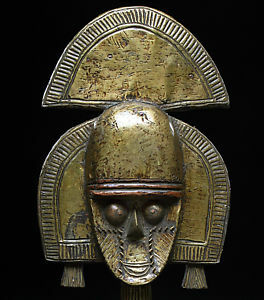 Popular Fang mask with flattened abstract features. Used to prevent bad luck and to repel evil spirits. Initiation mask with youthful, and adolescent appearance. Very popular white/black masks with asian features and some scarification. Exaggerated, distorted facial features highlight this ceremonial mask. Represents the attributes of female grace and beauty.